Extreme weather conditions and bumpy, high-speed descents can place an unnatural amount of strain on the joints – especially if they have been injured previously. However, with the right knee brace for winter sports, you can protect weakened ligaments, cartilage, and bone against these external forces and benefit from increased control, stability and endurance whilst out on the slopes. You might be a skier, a snowboarder or an ice skater. Perhaps you have a torn ACL (anterior cruciate ligament) resulting from strenuous physical activity, or an inflamed knee joint as a result of a degenerative disease such as osteoarthritis. Maybe you simply want extra protection so that you can continue to enjoy your favourite sport for as many more years of your life as possible. By choosing a knee brace with all these features, you will be giving your joints the protection, control and support they need, enabling you to exercise and increase your strength safely. By contrast, a cheap fabric knee support from the chemist will offer little control or protection except to keep the knee warm, which is an important aspect of masking pain from injury, but wholly inadequate without the rigid support and control offered by a brace. A top-of-the-range knee brace for winter sports can even help rehabilitate wasted muscles and improve anatomical alignment over time. This will enable you to return to an activity level close that is as close to your original one as possible. At Technology in Motion, we can make recommendations for you based on the type of injury, its severity, and the level of physical activity that you wish to achieve. 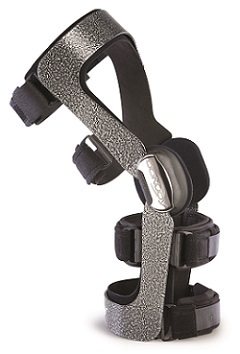 Once you have found a knee brace that you’re happy with, we’ll supply it to you and provide any further information and advice you might need. To arrange an appointment at one of our UK clinics, call us on 0330 100 1800; alternatively, browse our website for further information on sports injuries, osteoarthritis and different types of knee brace for winter sports.